Home » humor , Keyser Söze , Saturday night massacres , sherlock , sherlock holmes , the usual suspects » New SATURDAY NIGHT MASSACRES: Keyser Soze versus Sherlock! 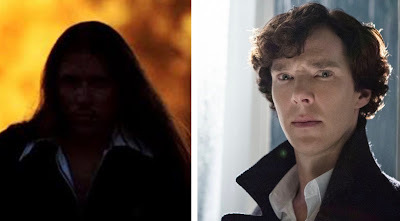 New SATURDAY NIGHT MASSACRES: Keyser Soze versus Sherlock! The previous Saturday Nights Massacre has just ended. With 83% of the vote Han Solo has hyperspace away with the Coors beer against Peter Quill's 17%. That's right: it's Keyser Soze versus Sherlock (from the BBC series). It is a clash of the intellects like nothing before. Voting is now open for two weeks until June 16. Who will triumph in this battle for the soul of the good people of London? YOU WILL DECIDE! Cast your vote and may the best mastermind win. Chris are you kidding us!? Okay, that comment made me almost spew Dr. Pepper onto my iPad. I still must defer to those who are voting as reflected in the final tally. For all we know that could have been Kobayashi pretending to be Kevin pretending to be Keyser pretending to be Kint.